Over the past year, GIS manager Wade Kloos has written a series of columns describing why and how you should document the return on investment (ROI) of your GIS department's work. In this article, he summarizes the previous columns and provides a list of best practices. This is the final article in my GIS ROI series. A quick recap of the previous three articles is in order. In the first article, I began with the reasons why GIS managers should document the ROI and benefits stemming from their good GIS work. I emphasized that a "growth" mind-set can be a pathway for discovering high-value GIS projects. In the second article, I identified the target audience for ROI reports and also revealed that when you document GIS results, you are creating—for yourself—a portfolio of your relevance, competence, and accountability that you can keep for your entire career. In addition, I introduced the one-page, abbreviated GIS ROI and Benefits Report that allows you to hit the ROI road running. I provided that report as a Microsoft Excel spreadsheet template that you could download and use. In my last article, I presented the ROI results from two years of documenting GIS outcomes at Utah Department of Natural Resources (DNR) and provided actual ROI reports that described business process problems and opportunities along with the GIS solutions that produced tangible business benefits and notable fiscal impacts. 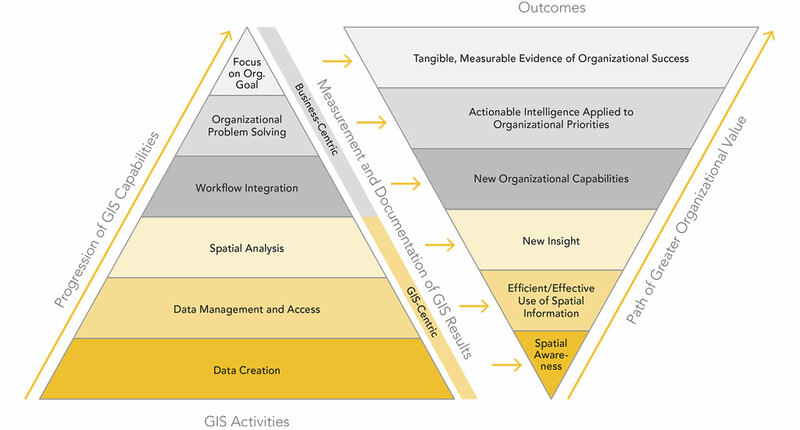 Figure 1: The GIS Activities Pyramid shows the relationship between GIS activities, their outcomes, and their value to the organization. So why am I (again) suggesting that GIS managers add GIS ROI workflows into their busy schedules? Because without it, GIS will continue to be undervalued and misunderstood. I want to remind you that organizational leaders can be fickle. They tend to forget the accomplishments and impact of your GIS, especially when these results are anecdotal in nature. As a business support function, GIS (along with its ROI results) will begin to be perceived by organization leaders as an integral part of business operations and the process of continuous improvement—a compass for progressive and successful organizations. Perhaps the most beneficial reason for doing regular GIS ROI is that you will improve your skills as a GIS manager. Specifically, you will hone your ability to discern the difference between high-performing/high-value GIS projects and those projects with less organizational potential and lower value. You will be a more effective communicator of business-related GIS benefits. You can increase your ability to influence how work is done and how decisions are made within your organization. These skills can inextricably link your great work to your organization's success. The more ROI reports you complete, the more you will find yourself focusing your GIS resources in areas that make the biggest organizational impact. You will better understand what GIS activities lead to specific outcomes and how those outcomes are valued by your organization—this is organizational clarity. With this clarity you will see which GIS activities cause specific organizational effects and the value of those effects. I have created the GIS Activities Pyramid (shown in Figure 1) to illustrate how certain GIS activities could relate to specific outcomes and organizational value. Every organization assigns value differently, and the relationships, shown in Figure 1 as arrows, may not be applicable in all cases. However, it should be obvious to you now that only through the measurement and documentation of GIS results can a GIS manager provide the clarity necessary for their organization to assign an accurate value to GIS results. Without establishing a documented link between what you do, the outcomes achieved, and their value to the organization, your organization is left with only a list of the things GIS can do. All these GIS activities—while somewhat general in description—are essential. To some extent, each successive level of the pyramid shown in Figure 1 requires the capabilities of the level below it. But as the graphic suggests, not all activities can produce the same organizational value. Because GIS does not exist solely to create a representation of the world, GIS must transcend its technical and GIS-centric genesis and apply itself to the business needs of the organization via business-centric and high-value activities. Even if your organization does not define its mandate for GIS, you should take to heart that your employer chose to invest in GIS (and you) so that your organization can accomplish its business goals, eliminate problems, and maximize business opportunities. Therefore, your destination on this GIS ROI journey is to positively affect your organization's business systems and inform your organization of the difference you make with ROI documentation. As a GIS manager, allocate 10–15 percent of your time ensuring GIS results are being documented and communicated and that high-value GIS projects are being defined and pursued. If you can't afford the time, delegate some of your existing tasks to others. Remember, no one else can provide the needed clarity to your organization. ROI workflows need to become habitual for GIS managers. Collaborate with your human resources and finance teams to define meaningful measures. Ensure that you are documenting success elements that are relevant to your organization in your GIS project ROI reports. Don't attempt to define the ROI for a GIS program first. Capturing ROI for an entire GIS program can be a daunting task. It is best pursued only after you have experience documenting ROI at the project level. Use GIS projects and the workflows they enhance to build a compelling business case for your work. Start small, build early victories, and seek greater returns from your future GIS projects. Produce a biannual newsletter on GIS ROI that summarizes the business benefits attributable to GIS. Ensure your organization's leadership reads it. Ask for more exposure to leadership-level management discussions so that GIS and its unique spatial thinking can be leveraged early on. Your documented, business-centric successes will provide you with credibility and demonstrate your usefulness in such discussions. Know your organization's main business goals and current priorities as well as those at the program level. If they are not well-defined or promoted, ask that they be defined for you so that your business support function can help the organization and its programs succeed. Deliver key business-centric solutions just as often as you conduct GIS-centric activities. "Map" your projects on the GIS Activities Pyramid to reveal where your team is spending its time and the corresponding value you are creating for your organization. This may reveal patterns you were not aware of relative to your GIS workload. What can you expect once you have established the ROI habit and proved that the results from your GIS work are tangible, verified, and valued by your organization? You will begin to sense that GIS is wanted and expected more because you have your management's attention. Leadership will increasingly open up to GIS and better describe their business goals, needs, and opportunities to you. Your ability to link GIS solutions to business needs will be tested. Program managers will seek you out to help redefine their workflows, primarily so they look good—and that's okay. GIS (and you) will become the business support function that is known to make an important difference. This will be partly due to how well GIS lends itself to—and integrates with—business processes and decision-making and partly because you know how to measure, document, and communicate the things your organization values. 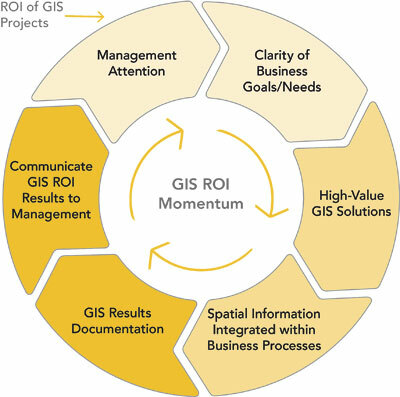 With ROI embedded within your GIS program's road map, I believe you will create and sustain a certain and beneficial momentum—the GIS ROI Momentum illustrated in Figure 2. 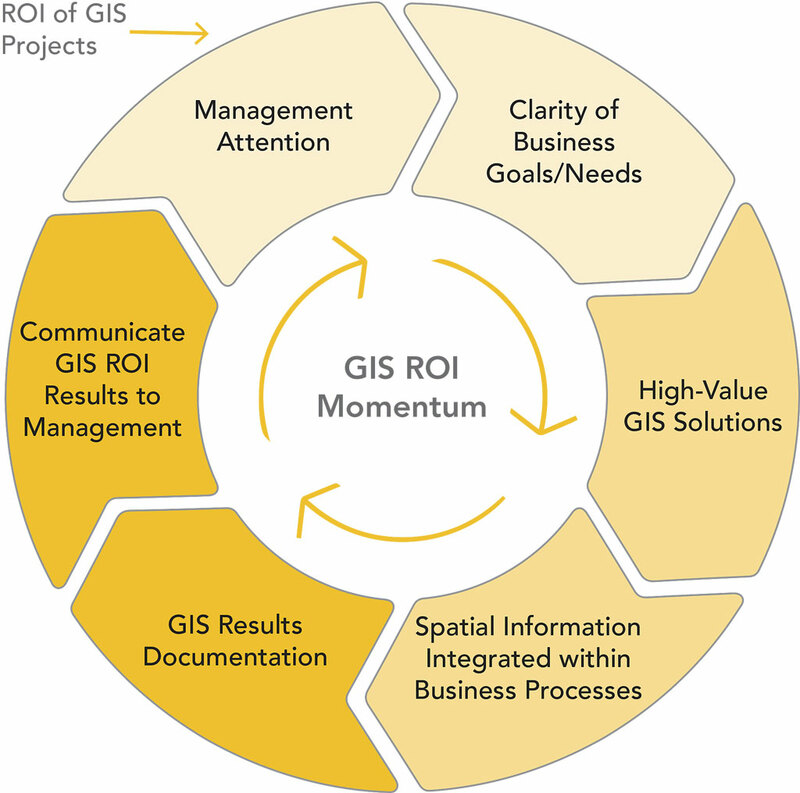 I hope that these four GIS ROI articles have provided you with practical advice, encouraging case examples, and ROI tools that you can use to begin or enhance your GIS ROI work. I firmly believe that GIS programs can hit the organizational ROI bulls-eye more often once they gain organizational clarity and develop the skill in measuring and documenting what they do, their results, and the value they deliver. Best of luck to all GIS managers and GIS professionals who choose to embark on the journey to take their good GIS work to the next level via the GIS ROI path.